I am sure, not only today you will notice it, but also you will look for it desperately. This time I have come up with an option which will provide you with a platform to start with your new adventures of life. You might be thinking how? The answer is- Go Daddy.com! Everybody knows about GoDaddy. You might have seen the Super Bowl advertisement over a decade ago. 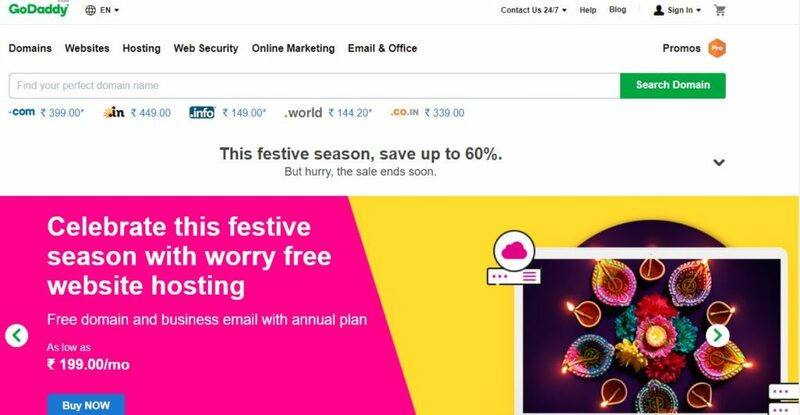 GoDaddy will not only help you in getting domains and web hosting at cheaper prices but also provide you with other more options such as web security, websites, online marketing as well as e-mails and office. GoDaddy proclaims – “we power the world’s largest cloud platform dedicated to small, independent ventures”. They are surrounded by approximately 18 million customers worldwide and 77 million domain names which are under management. 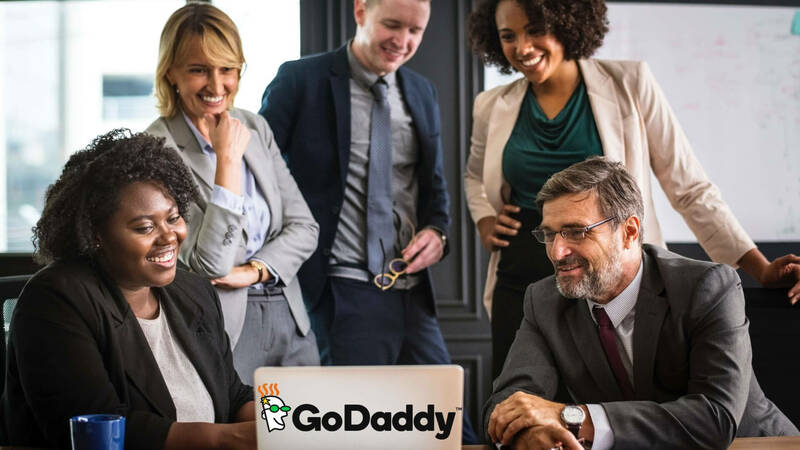 GoDaddy is a platform provided to the customers, where they can come up with an idea to name it, can build a professional website, also attract customers and can manage their work. Before we move further about GoDaddy I think knowing about the company’s origination will be a justice to it. In the year 1997, Bob Parsons an entrepreneur founded GoDaddy in Baltimore, Maryland. GoDaddy Inc. Is basically an American publicly traded internet domain registrar and web hosting company, which is headquartered in Scottsdale, Arizona and it was incorporated in Delaware. The company is known for its advertising in the newspapers as well as on televisions. By May 2017, GoDaddy had approx 17M customers, with over 6000 employees worldwide. Well, apart from all this GoDaddy was also involved in many controversies related to censorship. In 1997, when Parsons came out of his retirement to launch Jomax Technologies, which basically later became GoDaddy Inc. GoDaddy received a strategic investment from top venture capital funds, KKR, Silver Lake, and Technology Crossover Ventures. As the company- GoDaddy originated in the year 1997, it didn’t take much time for it to take the market position ahead of Network Solutions, in the year 2001, when the company was no more the only platform to register a domain. In the year 2001, GoDaddy was approximately the same size as the competitors Dotster and Enom. Soon, it became the largest ICANN-accredited registrar on the internet by April 2005. And today in 2018, the company has become the largest web host by the market share. GoDaddy is migrating the vast majority of its infrastructure to AWS (Amazon Web Services) as part of a multi-year transition- Announced by Amazon Web Services (AWS), March 2018. If we talk about the infrastructure, then GoDaddy was reported as the largest ICANN-accredited registrar in the world. The size is four times their closest competitor. GoDaddy also has a 270,000 square feet in Phoenix, Arizona. Let’s have a look at the awards and achievements of GoDaddy, from the year 2010 to 2018. So, guys, this was all about GoDaddy. But, this does not end, “Picture Abhi Baaki Hai Mere Dost”. Till now I have just informed you about GoDaddy. I didn’t tell you, how it can be beneficial to you. I think now we should concentrate on the pros of GoDaddy. GoDaddy has been in the industry for over 20 years. Obviously, they have learned a lot of things along the way. Apart from keeping your website live, a web hosting site should be good at its speed. The simple answer to it- because the internet is obsessed with the speed. See, if the speed of your web page is slow, it means to less revenue as well as visitors and fewer conversions etc across the board. It has been found that even a one second delay in the loading time of a website resulted in a 7% decrease in the conversions, even an increase of 11% in page views and also a decrease of 16% in the customer satisfaction- A Study by Aberdeen Group. Speed is really very important that even Google has provided a toolset to help everyone out. Now, over the past few years, we have seen some fast speeds and we were surprised at the performance of GoDaddy. GoDaddy was consistent at 448ms average speed. So, let’s see the performance of 2018. Well, in this case also GoDaddy has done right out of the gate, showing a 99.99% uptime for over 4 months. I should tell you that in this case “no kind of news” is good news. I am sure you don’t want to notice your host’s uptime. The reason is if you do something like this, more chances are there because your website is down again and obviously your visitors are pissed. The company GoDaddy is basically known for domains and hosting mainly. But apart from this, it seems they are laden with every kind of products for small businessmen. This means that they are served as a multi-store for you. There are countless products which are complimentary that will be good for your own new website. Some such products can be website builder and even GoCentral. These two can be used to build your own website. Apart from all this, they will also connect you with around 125 applications so that you can immediately add to your new hosting account. They will definitely take you up a step further and will provide you with an option of web design professionals. Now, you can add any product to your cart and even can request a call from an expert. They will take care of everything. So you can do the best to yourself. I think these “Pros” are enough to make you understand the importance of GoDaddy in your website’s life. Now, if you are thinking that searching for a domain name on GoDaddy is a difficult task, then believe me it is not. I will tell you how it is going to be done. First and foremost you have to start with the registration process. In order to avail the facilities provided by GoDaddy, you need to register yourself at GoDaddy. Now it will be easy for you to search for your domain name and make payment accordingly. Once you will reach the home page of GoDaddy, they will provide you with options for searching a domain name for your website. The bar shown allows you to type in some domain name which you have already thought about your new website. 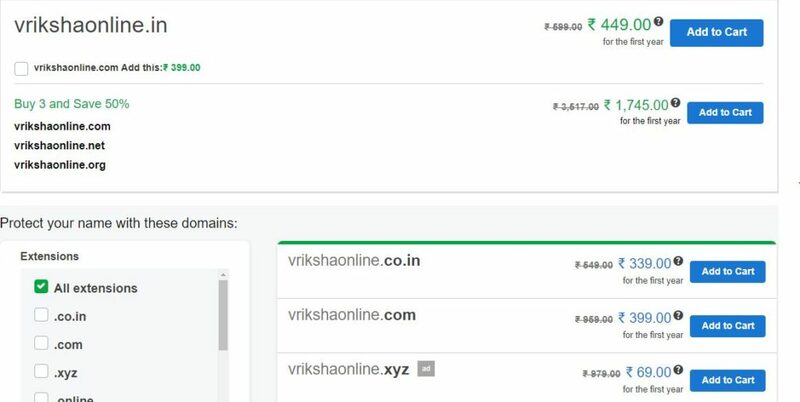 You can see I have typed “Vrikshaonline” to check whether the domain name is available or not. Then I clicked on “Search Domain”. Let’s see the results. You can see that I have got numerous options to choose for what I wanted. You can choose one and add to your cart and make payment as we do on an e-commerce website. See, I have told you it is very easy. I recommend GoDaddy because I have used the company for the selection of my domain name and hosting, and to date, I am not facing any kind of problem. In the article above, I have made you understand the importance of GoDaddy as the world’s No. 1 domain and hosting website. Choosing and buying a domain and hosting from a reliable website is really important, so that you may not face any kind of problems related to the speed and uptime later in the future. Once your website took some seconds to load, there will be an instant decrement of traffic on the website, which in turn will decrease the credibility of the company. So, according to me, there is nothing better than GoDaddy for me, for us as a team. I am sure; the facts are enough to help you in choosing the reliable website for the domain and hosting of your Dream Company or business. Please feel free to contact us at digitaldhairya@gmail.com. For more queries, please don’t hesitate in leaving a comment here.